The Patient Protection and Affordable Care Act of 2010 (the “ACA” or “ObamaCare”) has occupied the public debate for the last several months. However, much of the media coverage of these issues is highly inaccurate and generally untrustworthy. This problem is exacerbated by the lack of accurate information flowing from the political class in Washington, D.C. Moreover, there appears to be a deliberate campaign to conceal and disguise the truth regarding this program from the American public. It appears that the proponents of the ACA do NOT want Americans to understand its terms, and the implications this misguided law has for their health care. However, knowing the actual terms of the ACA and its implications is extraordinarily important for you and your family, as well as for your business. You cannot make sound choices either for your personal situation or for your business interests, without a complete and accurate understanding of the scope of the ACA and what it means for you. This Q & A is designed to give you a complete, albeit superficial, overview of the ACA and what it means for both your business and personal life. This is not a partisan “screed.” It is an accurate description of the law, as well as the author’s best interpretation of what the ACA changes will mean for the future. Most of us were warned as children not to “bite off more than you can chew.” The proponents of the ACA were either deprived of this common sense advice – or simply ignored it. 1. 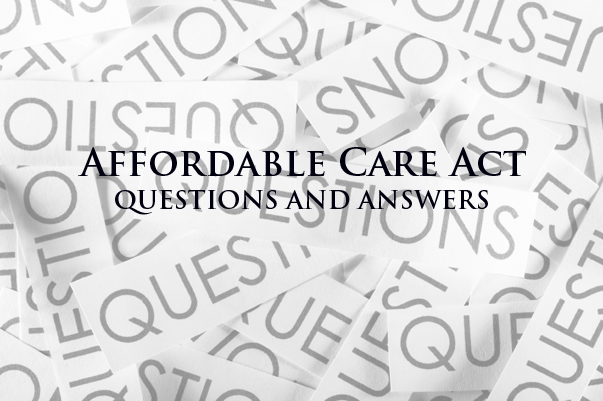 What is the Patient Protection and Affordable Care Act? The ACA was adopted early in 2010 with a goal of transforming the American health care system, or at least the financing of health care services in America. There are hundreds of provisions in the ACA that will change long-standing methods of financing health care services, and will have a significant impact on the availability and affordability of health care for millions of Americans. The ACA represents an effort to “federalize” many aspects of the health care sector that have historically been regulated at the state level, particularly health insurance. The ACA creates a federal overlay of rules and regulations on top of the pre-existing state scheme and will lead to a very complicated system of health care finance, with inconsistent regulatory provisions and goals. 2. What Are the Major Components of the ACA? g. The mandate that premiums for health insurance policies be based upon a “modified community rating” model, with only 3 age bands. 3. Can I Keep My Current Coverage? As a result of the minimum requirements that a health insurance policy must contain under the ACA, most people covered under individual policies, and those covered by small group plans, will lose their current coverage, except for a very limited number of plans that will be “grandfathered” if they are IDENTICAL to their terms as of the date the ACA was enacted in 2010. Individuals covered through large employer plans are much more likely to continue with coverage that is similar to their current coverage. However, the scope of future coverage is unpredictable as the ACA reforms create extraordinary cost increases in the overall health insurance market. 4. Am I Required To Purchase Insurance on an Exchange? No one is required to purchase insurance on an Exchange. However, if you believe you are eligible for a tax credit subsidy to reduce your premium cost, the subsidies will ONLY be available if you purchase a policy on the Exchange. 5. What Kind of Insurance Is Available on the Exchange? In each state, existing health insurance carriers have signed up to provide policies through the Exchange. Thus, you will have coverage through a private insurance carrier. However, these policies are NOT necessarily the same as the policies available in the general (non-Exchange) market and may have important differences, such as the depth and breadth of the provider network available. 6. Will Insurance Be Cheaper on the Exchange? It is highly unlikely that health insurance will be cheaper on the Exchanges. The policies offered on the Exchanges will attract older, and sicker, Americans who are unable to secure coverage elsewhere. In turn, the “adverse risk” selection will cause the premiums to rise rapidly. Thus, unless you qualify for a sizeable tax subsidy, you may be able to find less expensive coverage in the general market. 7. Is There Any Option to Buying the Expensive ObamaCare policies? As an individual, you are not REQUIRED to buy one of these expensive health insurance policies for yourself and/or your family that are mandated by the ACA to avoid a tax penalty. You can pay the tax penalty and decide to forego the purchase of any health insurance coverage, whatsoever. Nevertheless, for many individuals these may be attractive options because you can always secure full health insurance coverage on the Exchange in the event they become sick, without incurring ANY penalty. 8. When Does the ACA Go into Effect? Because of various problems with the “rollout” of the ACA, a number of provisions have been delayed from the original effective date of January 1, 2014. The requirement that large employers provide coverage or face tax penalties has been delayed until January 1, 2015. The requirement that all “sub-standard” health plans be eliminated from the market by January 1, 2014 was unilaterally “delayed” by the President in a speech on November 14, 2013. The extent of this “delay” is undetermined at this time. Because of the website problems, the enrollment date for securing “adequate” coverage has been extended to March 31, 2014, and is subject to change further. It is NOT clear what affect these delays will ultimately have on the individual tax penalties otherwise applicable next year, if you haven’t secured “acceptable” coverage. 9. Will My Large Employer Continue to Provide Health Insurance? Estimates have varied widely as to whether employers, both large and small, will drop health care insurance benefits for their employees. Generally speaking, it is likely that large employers will continue to provide some type of health care benefits for their employees. However, it may no longer be as robust. In fact, many large employers may choose to adopt a “defined contribution” approach to health care insurance. That would mean each employee would be given a fixed sum of money and be directed to a “private insurance exchange” in order to buy individual coverage from one or more companies participating in the program. Alternatively, they will be able to “shop” on the public Exchange. 10. Will My Small Employer Continue to Provide Health Insurance? Small employers have no obligation to provide health insurance coverage under the ACA. In many cases, they will simply drop the benefit because it will be too expensive. This is particularly true for small employers who have a relatively low wage workforce. Those employees will simply be directed to the public Exchanges and they will be able to qualify for a tax credit subsidy to assist with a purchase on the Exchange. 11. I Am Self-employed and I Don’t Qualify for a Subsidy. What Should I do? Alternatively, you may decide to purchase a fixed indemnity policy as long as you are healthy. As a result of the ObamaCare structure, you may be able to purchase a health insurance policy on the Exchange – in the ambulance on the way to the hospital. It all depends on your level of risk tolerance, your health condition, and your personal circumstances. You should consult with a qualified professional and NOT one of the “navigators,” who are paid to push individuals into the Exchanges, whether or not it is a prudent decision for them. 12. Can I Keep My Personal Physician? The answer is “perhaps.” If you are required to change insurance plans, as a result of the ACA driven changes, there is no guarantee that your new plan will include your current physician. Policies that are purchased on the Exchanges are very likely to have small provider networks and your current physician may, or may not, be included as a network provider. That means if you wish to continue using your current physician, you will need to pay an additional out-of-network co-pay. 13. What Will Happen Next with the ACA? Despite all of the problems already identified with the ACA, the current political situation in Washington, D.C. means that it is very unlikely that significant changes in this program will be made in the near future. President Obama is “invested” in this plan, which he considers to be his “signature” achievement. Unless both Houses of Congress come under control of the Democratic Party, a Republican-controlled chamber is simply not going to be interested in making any changes that will make this program a more tolerable burden for the public. The ACA has begun a transformation of the American health care system that will affect virtually all Americans over the next several years. The creators of this plan have unleashed forces of change that are now uncontrollable and will cause this entire economic sector to be altered in ways that are impossible to completely predict. Moreover, in light of the “divided government” in Washington, D.C. it is highly unlikely that there will be any significant legislative changes to the ACA prior to 2017. That means, whether for good or ill, the current uncertainties will continue. RELATED on OCR: Read all articles by Bill Todd here.